On Sunday 19th May 2019 we collaborate with Custom Sailing Costa Brava in the organization of the 5th Cales of Calella. 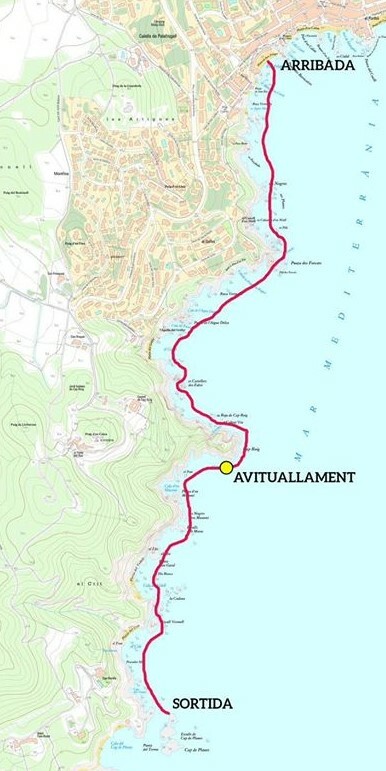 It is a non-competitive swim of 3,4k crossing the beaches annd coves of the area of Calella de Palafrugell (from Cap de Planes to the beach of Port Pelegrí), in memory of the Glòria Sant. The swim will be organized in groups of 30 people according to level, led by two guides, SUPs and follow-up boats that will accompany each group. We will leave from Roques Plans and swim very close to the coast passing by Crit, Vedell, Banyera de la Russa, Cap Roig, els Castellets, Golfet, els Forcats until arriving at Platja del Port Pelegrí in Calella de Palafrugell. 33.00€ between April 1 and May 10. 9.15: Homage to Glòria Sant. Reminder of regulations and rules. 9.30-11:30: Start swimmer&apos;s transfer to the start point (Cap de Planes) and beginning of the swim in groups. 12.30: Time limit of arrival - Pica pica.